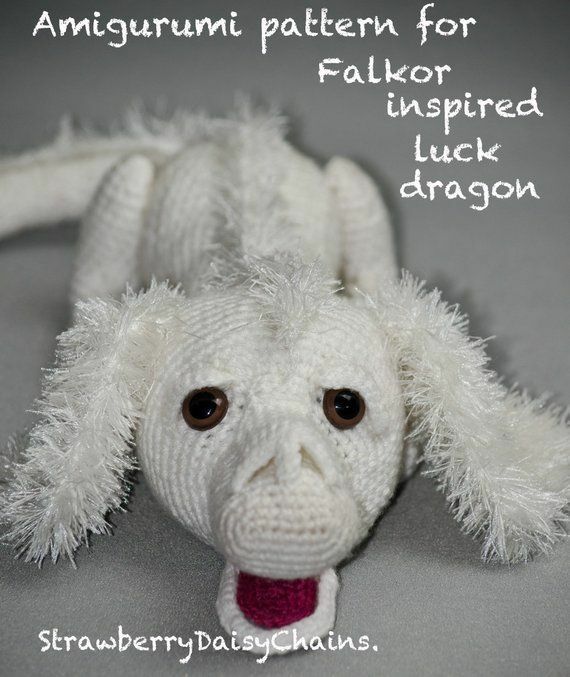 I had originally thought that I would create a Leprechaun feltie to share with you for St. Patrick’s Day. I’m not sure when it happened, but, I found myself creating a little bear with a vest and hat with a glittery shamrock instead. 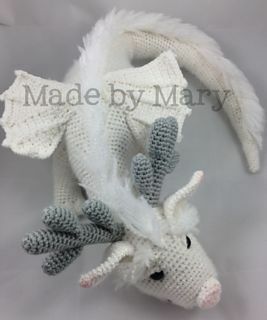 I think he came out super cute and I thought I would share him with everyone, including a pattern and some tips and hints. I only had 6mm buttons and thought they were too big – and why oh why do they make them so darn thick too? I dug out my sequins and glitter and thought one of those clever multi-use items was perfect. My little pink flower buttons are actually 2mm nail embellishments – as in, embellishments to use with manicures. Mine came from a local 100 pennies store. The packaging makes them super easy to store and keeps them quite tidy. 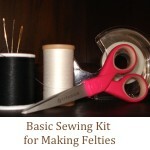 It has a nice variety and I can’t wait to use those pretty little fimo flowers on a project. If your 100 pennies store doesn’t have anything like this or you just want a bigger selection (our store generally has only one or two to pick from at any given time), you really should check out Amazon.com. There’s tons and tons of different little embellishments being sold as nail art. 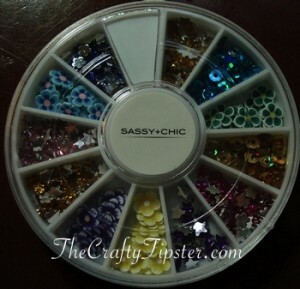 This option, 3000pcs 2mm Nail Art Flower Rhinestones Wheel looks like it includes little pink ones like I used. It seems like the prices for the teeny nail embellishments are often better than those for items being marketed in the crafts section. 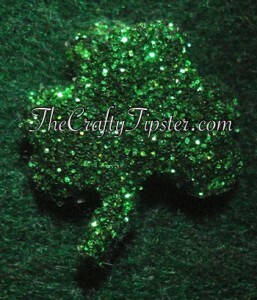 I glued super fine green glitter on the shamrock. I laid the felt shamrock on a bit of waxed paper, spread a layer of tacky glue all over it and then sprinkled the fine glitter over it. I left it to dry for several hours and then did another layer. I thought it would be a great idea to put a top layer of glue on the glitter to keep it from shedding. It works to keep the glitter in place but it also ruined the glittery-ness. I ended up putting another layer of glitter on top of my failed “finish layer” for a total of four layers of glitter. An added bonus is that it stiffened the felt which should help keep the stem from unraveling. With such a small item, using a super fine glitter like Martha Stewart Crafts Fine Glitter, Peridot should provide the best results. Regular kids glitter will work but it will look a bit chunky. The bear’s belly button is made with a French knot. 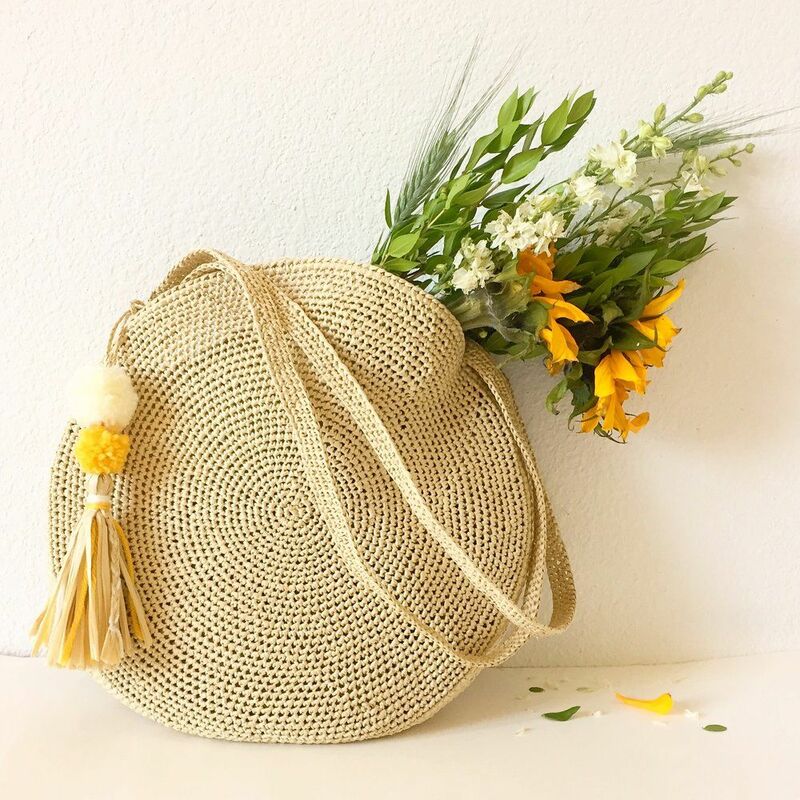 If that stitch is new to you, we have a French knot stitch tutorial that might help. I had run out of black embroidery floss – a good substitute is to use three strands of black sewing thread and double them (allows for only three strands through the eye if the needle but six strands to embroider with). The nose and inner ear pieces were so small that I just used a regular straight stitch to attach them. I just sketched this pattern and rather than waste more time (I tried, I really tried) on making it look like a store-bought pattern with nice sharp lines, I’ve included a scan of my pieces. 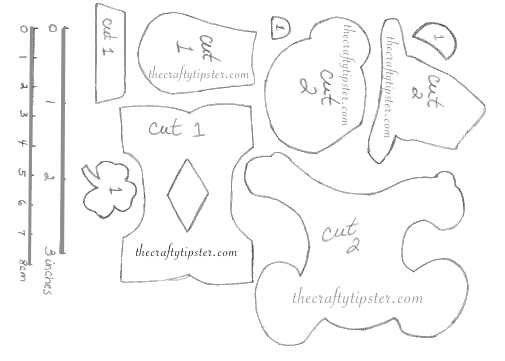 I’ve included a sizing guide in both inches and centimeters to help you keep from making the pattern pieces too big or too small. 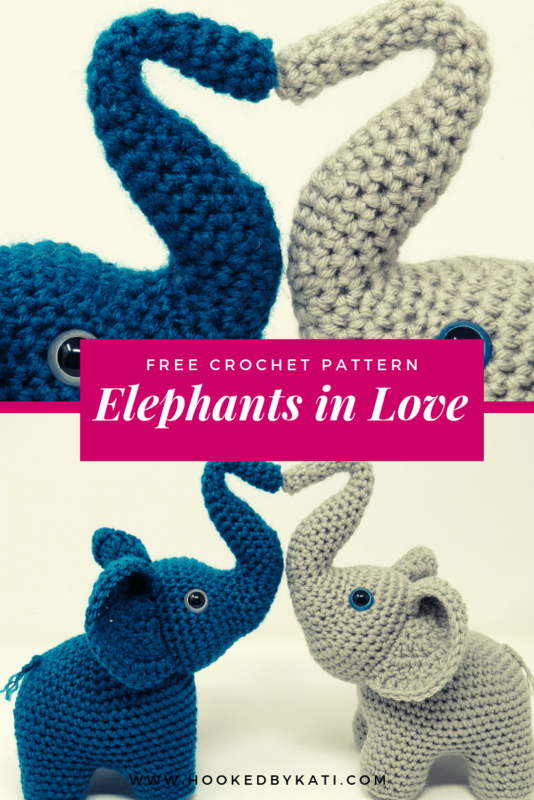 It makes it easier to hide the threads and knots by embroidering the snout, face, belly and inner ear pieces in place before assembling the bear. I attached the hat band after I put the hat together. The vest is not actually sewn to the bear. To make it look more finished, I ran blanket stitch along the neck opening and where the arms go. I draped the vest over the bear and sewed the seam on one side and then took the vest back off. I then did a blanket stitch along the bottom (you can do it on the bear but it’s harder.) After covering the neck, sleeves and bottom of the vest with blanket stitch; I put the vest back on the bear and closed the second side with blanket stitching. Leave the hat open at the bottom to slide it down over the bear’s head. Be sure to angle it low enough to cover where the ear would be; otherwise it looks like the bear is missing his ear. 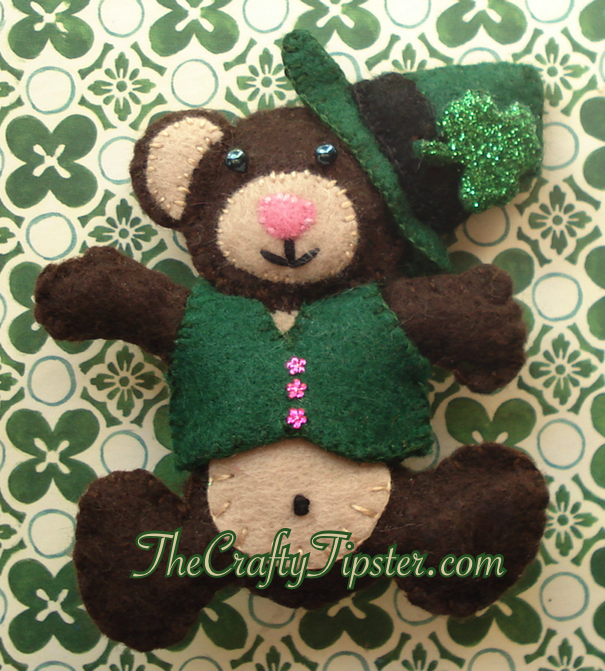 I do hope you let me know what you think of my St. Patrick’s Day Bear pattern.